And for the team that shot 14-of-30 from beyond-the-arc — they live to fight another day. 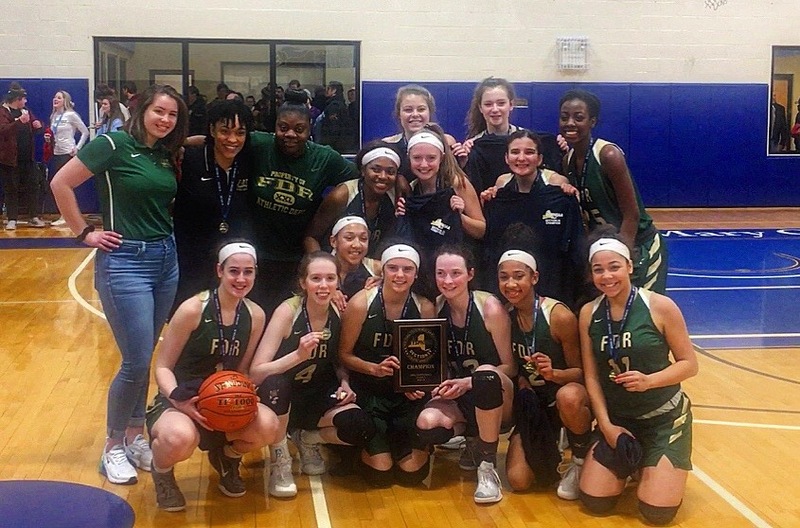 FDR Roosevelt defeated Saugerties 60-46 in the Class A final. It’s the Presidents’ first ever Section 9 title and first sectional championship since 1986 when they were in Section 1. The three-point barrage started almost immediately, when junior guard Kelsea Demelis hit three straight three-pointers in the first 1:27 of the game. Earlier in the season, Roosevelt had lost to Saugerties twice. Kelsea added that her and the team had some pregame jitters before facing off against the Sawyers for the third time. She led both teams with 17 points, and five three-pointers. She also scored her 1,000th career point, becoming the fourth girl from FDR to reach the milestone. It was Paden’s first season as the coach of FDR after replacing Cliff Sauer. She played for the Presidents from 2005-07, averaging 12 points per game. For her, there’s no better feeling than being apart of a championship-winning season for her alma-mater. FDR becomes the highest seed (No. 5) to win a Section 9 final since Highland (No. 6 in the 2016-17 season). They were an underdog in all three playoff games, defeating No. 4 Red Hook, No. 1 Cornwall & No. 2 Saugerties. Being an underdog has its perks too. Demelis added that a lot of people doubted FDR, and they used that as motivation. FDR’s next game is on March 6th at 5 p.m. in the subregional round of the state tournament. They will play the winner of Section 1’s Class A final between Tappan Zee (19-4) & Somers (16-6) — which is scheduled to be played tonight at 7 p.m.